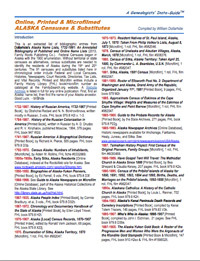 This Genealogists' Insta-Guide is made up of 91 censuses and census substitutes, listed in chronological order. The biographical entries include Federal and Local Censuses, Histories, Newspapers, Court Records, Directories, Tax Lists, and Vital Records. Website addresses have hot links to the online sites. Note that a FREE PDF download of this Insta-Guide is currently available with the purchase of this laminated item.